“I was born with the gift of rain, an ancient soothsayer in an even more ancient temple once told me. This was back in a time when I did not believe in fortune-tellers, when the world was not yet filled with wonder and mystery. I cannot recall her appearance now, the woman who read my face and touched the lines on my palms. She said what she was put into this world to say, to those for whom her prophecies were meant, and then, like every one of us, she left. And so we find ourselves in the rainy life of Philip Hutton in present-day (or so) Penang. These two people have one person in common – Endo-san. Philip tells Michiko his story of Endo-san. This begins in 1939, when 16-year-old Philip meets the Japanese diplomat who rents a nearby island from the Huttons. Philip, as the half-English, half-Chinese youngest son feels like he doesn’t belong in either the British or the Chinese communities of Penang (then a British colony). He is intrigued by this man whose “features were too sharp for a Chinese, and his accent was unknown”, and who begins to teach him aikijutsu, Japanese language and culture. Philip in return shows him around Penang. Their lives are bound together, their past, present and future. Unfortunately, when Japan invades Malaya, Philip finally understands that his sensei has made use of his knowledge of Penang to aid the assault on the island. Believing that it is the only way to keep his family safe, Philip works with the Japanese, which makes everyone, even his own family, scorn him. 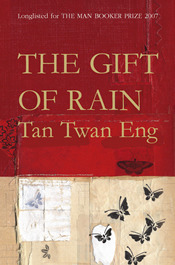 The Gift of Rain can be described as a war novel, historical fiction, but it is also a story about duty and discipline and love. It is an ambitious first novel, with interesting supernatural connections and a background molded from fact and history. Some of the descriptions are perhaps a little too dramatic (it would however make for quite a spectacular movie). In the end though, The Gift of Rain was an engrossing, sad read about this young man who is torn between several worlds, who learns so much about himself and the life he has to lead. And more importantly, it is a book set in a part of a world familiar to me, but that unfortunately hasn’t been all that much written about. It’s taken me quite a few years to actually get my hands on this book. I was first truly aware of The Gift of Rain in 2008 (it was shortlisted for the Booker in 2007, but I don’t think I gave it much thought then), when my family and I travelled to Penang for my cousin’s wedding (her husband’s family is from Penang – and boy did they know where all the good food was!). We decided to tour the Cheong Fatt Tze Mansion (there are some great photos on this blog), a gorgeous late 19th century two-storey courtyard house painted a startling blue. At the end of the rather interesting architectural and historical tour, one of the participants asked the guide if this were indeed the book mentioned in The Gift of Rain. I can’t quite remember what his reply was but it was in the positive, for Tan does mention the Cheong Fatt Tze Mansion in his book (unfortunately I had to return the book before I remembered to take note of when that is). It isn’t the coastal mansion that the Huttons live in, but is mentioned as La Maison Bleu. Anyway, I’ve been sitting on this review for a couple of weeks now, so the news that Tan Twan Eng’s The Garden of Evening Mists was recently shortlisted for the 2012 Man Booker Prize was that kick that I needed. Apparently his latest book is set in Cameron Highlands, which my mum tells me we visited when I was really young, so I’m looking forward to getting my hands on it (I’m hold number 5 at my library). Interesting knowing where the title comes from: it’s lovely. I hadn’t noted this first novel, but I’m on the hold list for the second…not as close as you are, by the sounds of it (fifth), but it sounds like a couple of weeks or so. It’s another pretty title, too, of course. Ah yes I am fifth but the book has yet to actually reach the shelves as its status is still ‘on order’! So we’ll see how long it takes! Tan Twan Eng is an author who was unknown to me before Garden of Evening Mists was nominated for this year’s Booker. I’ve read mixed opinions about that book, but your review has convinced me to read this book at least. 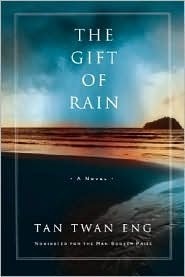 I feel that I can learn a lot on South East Asian history from The Gift of Rain. I think this book (and I’m guessing his latest book too) does provide a great perspective to one not familiar with the region. I’m not from Malaysia but close enough I suppose, so I’m not the best judge of a book about Penang (ask JoV!) but it made me think of home. And how I miss the rain.